We are all hungry for something and there are different types of hunger. There is, of course, physical hunger for food, but too often people aren’t really hungry for food – or don’t know how to recognize their physical cues. Some people – including kids – are hungry for comfort; others are hungry to fit in or belong; while some are hungry for feeling safe, secure, successful, or happy. Others crave to be the best, to win, or to be perfect. In fact, our tendency to overeat or constantly choose highly palatable treats over a simple piece of fruit (as the above image suggests) limits the opportunity to really figure what you’re hungry for. Before we dive into this topic, it’s important to understand that there is nothing wrong with enjoying some of our favorite treats or goodies (unfortunately referred to by many as “junk food”). I don’t find this language helpful, nor descriptive of some of these favorite dishes that are often heirloom recipes reflective of time-honored traditions. I do believe, from personal and professional experience, that it can be easy to get off track from recognizing and honoring our internal cues of hunger and fullness – which are really one of our first biological instincts that we are born with. So my hope is that with a little lesson in terminology, along with some simple nutrition interventions, your awareness of physical cues can be differentiated from other times when food is perhaps being used for another purpose. Hunger is a physiological need for food. Appetite is a psychological desire or craving for food or drink, in other words, what sounds good? Both hunger and appetite determine what, when and why we eat. At times we are not hungry but have an appetite, such as seeing a dessert after eating a meal. Or, we may be hungry but not have an appetite, such as when we are sick. What is the difference between fullness and satiety? Fullness is usually associated with a satisfied feeling in the stomach or, if you overeat, an uncomfortable feeling. Therefore, fullness is a function of the amount of food you eat. Satiety; however, is feeling satisfied, or not being hungry, that lasts after the initial feeling of fullness subsides. Macronutrients in the food you eat can influence feelings of fullness and satiety. For example, while fiber in food may promote a feeling of fullness in the short term; protein and fat have a lasting affect on satiety. How do you know if you are hungry or full? The ability to use your internal cues to notice hunger and fullness may be difficult for some people and are only noticed until they are strong or intense. For example, you may not notice the physical signals of hunger because of consumption of coffee or diet sodas. Eventually, you may become “famished”; and consequently overeat, not realizing how physically hungry your body really was. On the flip side, you may not recognize the feeling of fullness until you feel uncomfortably stuffed. The following scale is designed to help you become aware of your internal cues so you can manage your intake. Why do I feel “full” but not “satisfied”? Feeling full is a function of the amount of food you eat; for example, the amount of food on your plate also takes up room in your stomach. However, sometimes it’s not just the amount of foods eaten, but the characteristics of that food that lead to fullness. For example, the water and fiber content of the foods we eat can all influence fullness. Satiety is a measure of many factors, most important being the macronutrients (such as protein and fat) in the meal that signal the brain you have had what the body needs. For example, I could eat a whole plate of lettuce or drink a 20 ounce diet soda. It will certainly take up a lot of room in my stomach, but shortly you will get urges to eat more because the proper nutrients weren’t supplied. The impact of individual macronutrients on satiety is typically measured in experimental studies. From this research, we know that sugar and fruit provide a quick source of energy, but are quickly digested and absorbed, so don’t stay in the stomach as long, compared to complex carbohydrates, fat and protein that take longer to digest. A food that is reported to have high satiety tends to produce a longer “intermeal” period (a period of time between eating episodes during which an individual does not experience hunger). Foods containing protein and fat tend to promote longer satiety between meals. There are many other factors, including food temperature, pleasure of food, individual issues such as blood sugar and hormonal response to food, or trying to use food to solve a problem (which it can’t do) that may continue to trigger the urge to eat or not feeling satisfied. What can I do to better honor my internal cues of hunger and fullness? Awareness of your internal cues of hunger and fullness is a great first step. You can do this by using the sample hunger and fullness scale and noticing how you feel before and after meals and snacks. Keep a journal. Record when and what you eat along with rating how hungry you are before and after a meal or snack. Awareness of emotional eating. Check in with how you are feeling (bored, happy, sad, angry, frustrated, etc.) before you eat. Are you eating because you are hungry or to “fix” a feeling? Include a balance of macronutrients in meals and snacks. Include protein and fat in meals and snacks to promote satiety and decrease overeating between meal. If it seems you are out of touch with your internal cues (i.e. always hungry, never feel full, or never hungry), planning your meals ahead so they are well balanced, and include moderate portions, is vital to help you reconnect and relearn your hunger and fullness cues. Dr. Susan Albers (www.eatq.com) has a number of resources and books to help individuals improve their relationship with food and eating. Following is an infographic that illustrates a decision tree for discerning the difference between physical and emotional hunger. Beginning to increase your awareness of these difference can be a great first step to reclaiming and honoring our first biological instinct! Categories: Mindful Eating | Tags: appetite, disordered eating, emotional eating, fullness, hunger, intuitive eating, mindful eating, overeating, satiety | Permalink. Thanksgiving is upon us! Typically thought of as the day of “football and the fatty feast”, it’s also that time of year – you know the stretch from Thanksgiving to New Year’s Day featuring endless buffets and tempting carb-laden goodies. There’s no reason you can’t “have your pie and be healthy too!” But, a few important tips may be the key to help you make it through this blissful time of year. Holiday weight gain (and frankly indigestion) tends to be related more to “how” we eat rather than “what” we eat. Yes, eating a bunch of highly palatable food doesn’t help with weight management, but throw in alcohol, dieting, busyness and stress and you have a perfect recipe for over-eating. (Read more about this) So, how can you make sure you are able to successfully enjoy your holiday parties, time with family and friends and manage your weight at the same time? Holiday cooking was sheer joy in my grandmother’s Nebraska kitchen! 1. Set yourself up for success. Eating less all day to “save up” for the Thanksgiving feast or holiday party is not helpful. Skipping meals/snacks usually affects productivity, causes poor concentration, more difficulty with problem solving, and increased fatigue. It can also lead to overeating at the next meal or snack, such as at the holiday party or gathering. Take time to enjoy a bowl of soup, yogurt, or veggies and hummus at your regular meal or snack and come to the meal hungry but not ravenous! 2. Take a plate and practice portion control. Many individuals often graze or “pick” at the foods when cooking in the kitchen or standing by the buffet or appetizer table. By the end of the event (or before the meal even begins), you’re stuffed and wonder why. 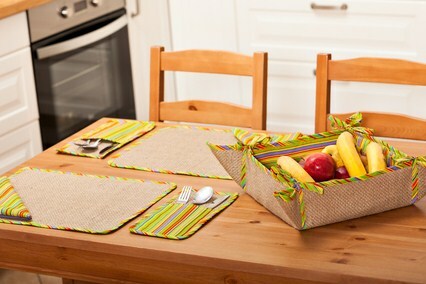 Sit down and have a snack if you’re hungry when cooking. Learn to indulge intelligently at the buffet by first scanning the table to figure out which foods will be most satisfying for you. Make a plate balanced with some protein, veggies and fruit and whole grains. For example, make 1/4 your plate protein (i.e. turkey); 1/2 your plate fruit and vegetables (i.e. green beans and cranberry salad); and 1/4 your plate whole grain carbohydrates, (i.e. stuffing). I know, I know, I know…what about the hot dinner rolls or mashed potatoes and gravy? My recommendation is to enjoy your favorite foods while eating mindfully. When you portion your plate with moderate amounts of food, eat slowly, savor every bite, and then stop when you are comfortably full, you will feel better! Remind yourself that you can have a serving of the sweet potato casserole at the next meal or enjoy the piece of pie at your next snack. 3. Location, Location, Location. When you realize you are not hungry, step away from the food. Try to sit or stand away from the food table and near supportive people to decrease the urge to mindlessly eat. Take time to enjoy the folks you are celebrating the season with – participate in conversation, listen to stories, learn something new about a friend or relative. Most important, try to relax and have fun. 4. Drink water. This is often the most common mistake people make. On average, women and men need 2.7 and 3.4 liters of water per day, respectively. This does not include additional fluid needs for activity. Also, with the hustle and bustle on the day of a party may lead to decrease fluid intake. Thirst is often mistaken for hunger and can lead to overeating. Try to drink small amounts of water frequently throughout the day – and at your holiday party – with added limes, lemons, or cucumbers for extra flavor. An added benefit for some can be decreased headaches by avoiding dehydration. 5. Move your body! Take time to include moderate, enjoyable movement in your day. Ideally 30 to 60 minutes of some cardio and strength training activity is recommended daily. If you already have an exercise routine, try and stay with it. You may also want to include less frenzied activity such as a yoga class or a peaceful leisure walk under the stars. To include the family (and unplug), consider walking together after a holiday meal; ice skating at a local park; going to a good museum or the zoo instead of sitting around. Remember: Don’t over-think healthy eating. Keep food in it’s place and you will do great! Categories: Mindful Eating, Uncategorized | Tags: diets, Holiday eating, mindful eating, Thanksgiving | Permalink. With Halloween behind us and Thanksgiving lurking ahead, it’s not uncommon for folks to feel some anxiety about food, eating and weight. Most people know that what you eat has a powerful effect on your ability to perform your best – at work, at home or in the gym. However, with the holidays around the corner, efforts at good nutrition often seem insurmountable with busy schedules, endless parties and tempting carb-laden goodies everywhere you look. Too often I hear many health-conscious individuals proclaim that their strategy to maintain control (coincidentally when life feels out of control) is just “tighten up” those food rules. Vowing to steer clear of certain foods or not eat and “save up” for a special meal or event are a couple examples. Unfortunately, this strategy often backfires. Numerous studies have concluded that being overly hunger is truly the “best spice” for increasing overall intake and cravings for foods higher in sugar, salt and fat. According to a report published in 2008 by the USDA Research Service, long stretches between meals (5 to 6 hours compared to 4 hours) and eating away from home contribute to individuals eating significantly more calories with lower diet quality. In another study, when researchers presented healthy females with high and low calorie food pictures after a brief period of food restriction, MRIs of the reward centers in their brain indicated an increased desire for the more calorically dense foods (Siep, 2009). 1) Plan to limit the time between meals. Aim for 4 hours between meals, giving yourself permission to eat enough at each meal rather than waiting too long, or conversely, grazing throughout the day. Planning meals that include high quality fruits and vegetables, healthy fats, wholesome carbohydrates and lean sources of protein will provide essential nutrients to keep you satisfied and sustain a healthy immune system during the cold months ahead. Eating mindfully (i.e. slowly, without distractions and savoring your food) while staying aware of your internal cues of hunger and fullness will also help regulate overall energy intake. 2) Choose nutrient-dense snacks. Pair fruits and vegetables with protein-containing foods such as nuts, cheese and yogurt to stay fueled during the most active part of your day and prevent ravenous food binges later on. Seek out seasonal fruits such as apples, pears, and oranges that are full of flavor and vitamin C – an important vitamin and antioxidant to keep you healthy and prevent you from missing important workouts or training. 3) Limit intake of foods prepared away from home. Instead, enjoy more home-cooked meals! One thing that most nutrition experts agree on is this point: everyone needs to be cooking and preparing more wholesome foods at home. To manage busy holiday schedules, plan ahead and seek out healthful, convenient food options when eating away from home. For example, a bowl of butternut squash soup with a hearty salad or sandwich. For grab-and-go, consider trying a couple new recipes that incorporate flavorful, wholesome ingredients. Remember, keep good food in your refrigerator and you will eat good food. 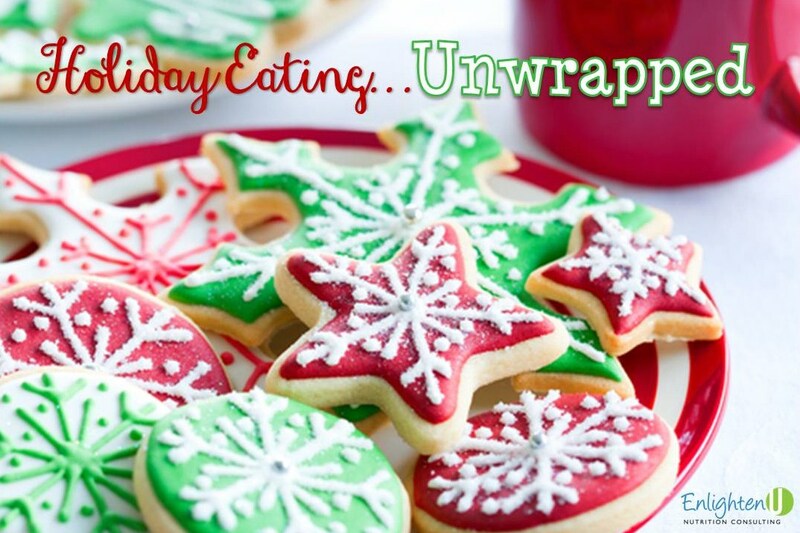 Categories: Uncategorized | Tags: diets, Holiday eating, mindful eating | Permalink. Health Halos…A Culprit for Overeating? 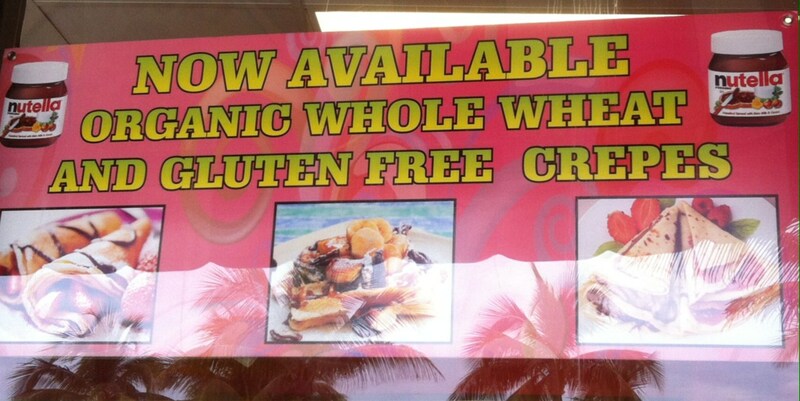 I was very amused with this ad in the window of an ice cream parlor during my recent vacation. It is interesting to me how we can be so “health-conscious” in America, yet continue to struggle with increasing waistlines. While buzz words such as natural, organic, whole wheat, low fat, gluten free, non-GMO are intended to guide the health-conscious consumer to simple healthy solutions, it seems we just continue to eat more – not less. Brian Wansink and Pierre Chandon from Cornell University have researched this paradox and describe a “health-halo” effect when foods are labeled in this way. Their research indicates that consumers underestimate how much they are eating and end up increasing their overall calorie consumption. See article here. This phenomenon is hardly new in our culture. I can vividly recall the “Snack Well” era which is another great example of this health halo effect. Back in the late 80’s, eliminating fat in foods was the solution to America’s increasing waist line. Therefore, non-fat foods such as Snack Well cookies, Entenmanns pastries, and a slew of nonfat versions of cheese, salad dressings, etc. filled the grocery stores. Misguided consumers believed that if you eliminated fat in food, you would lose weight and be healthy. When that didn’t work, carbohydrates were suggested as the culprit for our health problems. Today, branding foods to help guide the consumer to healthy food options seem to continue to confuse consumers. When an individual is trying to manage their weight and health outcomes, it is vital to recognize that “eating healthier” doesn’t necessarily mean that an individual has created a caloric deficit that prevents weight gain or result in weight loss. Instead, staying aware of portions and internal cues versus judging food – not as “good” or “bad” or an opportunity to “indulge” – can help reduce mindless eating. Remember, eating doesn’t need to be so difficult. Categories: Uncategorized | Tags: emotional eating, health halo, mindful eating, overeating, Weight loss | Permalink.